A Drug Enforcement Administration officer stops at a ranch in Texas and talks with an old rancher. He tells the rancher, "I'm here to inspect your ranch for marijuana." The rancher points and says, "Okay, but don't go in that field over there." "Mister," the DEA officer explodes, "I've got the authority of the federal government with me!" He produces his badge from his pocket and proudly displays it to the rancher. "See this? This badge means I'm allowed to go wherever I want -- no questions asked or answers given. Have I made myself clear? You understand me, old man?" A short time later, the old rancher hears loud screams and sees the DEA officer running for his life chased by the rancher's gigantic Santa Gertrudis bull. The rancher throws down his tools, runs to the fence and yells at the top of his lungs: "Your badge. Show him your BADGE!" 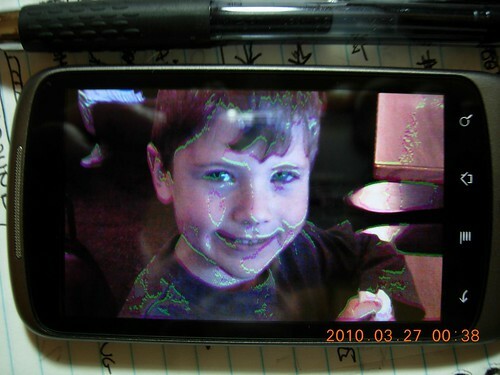 If your Nexus One screen looks anything like this, HTC is aware of the problem. They said they are working "day & night" on a "fix." It sounded like they weren't quite sure why some phones had problems and others did not. At this point they're hoping for a software/frimware fix, but a recall is not out of the question. So they basically told me to be patient and wait. These articles were published on March 30, 2010.